Use random passwords for websites with lengths of 15-20 . if you dont use them always, you can ask to send password to your master email. 2. Protect your master account. Never keept it's password on phone or your text book. Keep it in your mind and safe at home. 4. Dont reuse passwords in different accounts. Consider randomizing your username depending on what you are protecting. Never use your online banking user id anywhere. Your friends and relatives knows answers to default questions given by google and yahoo. Create your own privcy. What was my favorite food, drink when I was ill? combine information in a question. And make it random. Pay a special attention to "Posts by me"
1. Don't assuem that your virus guard to protect you 100%. 2. Don't Accessing an account through an e-mail link to provide sensitive information. Criminals using “phishing” scams use emails to steal your logins, account numbers and other sensitive data. The web you use would look like genunie with same design and have a url like somedomain.com/facebook or even facebook1.com to disguise. They look legitimate to users who are busy. "it’s pretty much impossible for people to know … if the e-mail is real or not" says an expert. If you use one password for all accounts and If somebody manages to get hold of your password … they will have entry into all your accounts and impersonate you. Free software is good. Only download software from places you know are safe like sourceforge, cnet etc. Some “free” software comes loaded with spyware. They hijack your browser, port 80 and employs keystroke-capture programz to steal your personal data. They take you to spyware sites or have malicious software downloaded to your computer. Instead, click on the tiny “close” button in the right corner. Best is to enable your browser’s pop-up blocker. Use a separate card for your online purchases. Don’t shop online with debit cards, if stolen they offer no liability protection. 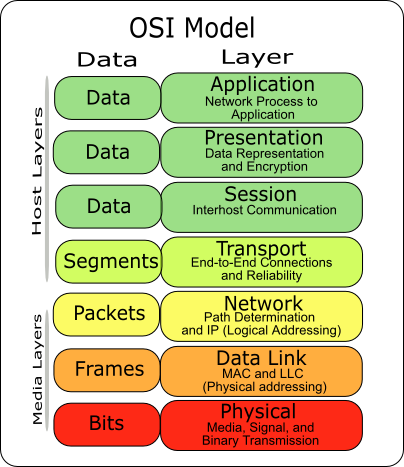 The Open Systems Interconnection model (OSI model) introduced by International Organization for Standardization. It standardizes the functions of a communications system in terms of layers. OSI groups similar communication functions into logical layers. An instance of a layer provides services to its upper layer instances while receiving services from the layer below. For example, a layer that provides error-free communications across a network provides the path needed by applications above it, while it calls the next lower layer to send and receive packets that make up the contents of that path. defines electrical and physical specifications for devices. defines the relationship between a device and a transmission medium, such as a copper or optical cable, including the layout of pins, voltages, cable specifications, hubs, repeaters, network adapters and more. Sharing communication resources effectively among multiple users. Provides the functional and procedural means to transfer data between network entities and to detect and possibly correct errors that may occur in the physical layer. Provides the functional and procedural means of transferring variable length data sequences from a source host on one network to a destination host on a different network. Performs network routing functions, and might also perform fragmentation and reassembly, and report delivery errors. Routers operate at this layer, sending data throughout the extended network and making the Internet possible. Provides transparent transfer of data between end users, providing reliable data transfer services to the upper layers. The transport layer controls the reliability of a given link through flow control, segmentation/desegmentation, and error control. Some protocols are state- and connection-oriented. This means that the transport layer can keep track of the segments and retransmit those that fail. The transport layer also provides the acknowledgement of the successful data transmission and sends the next data if no errors occurred. Transport layer is like a Post Office, which deals with the dispatch and classification of mail and parcels sent. The post office manages the outer envelope of mail. Higher layers may have the equivalent of double envelopes, such as cryptographic presentation services that can be read by the addressee only. The Transmission Control Protocol (TCP) and the User Datagram Protocol (UDP) of the Internet Protocol Suite are commonly categorized as layer-4 protocols within OSI. Controls the dialogues (connections) between computers. It establishes, manages and terminates the connections between the local and remote application. It provides for full-duplex, half-duplex, or simplex operation, and establishes checkpointing, adjournment, termination, and restart procedures. The OSI model made this layer responsible for graceful close of sessions, which is a property of the Transmission Control Protocol, and also for session checkpointing and recovery, which is not usually used in the Internet Protocol Suite. The session layer is commonly implemented explicitly in application environments that use remote procedure calls. Establishes context between application-layer entities, providing independence from data representation (e.g., encryption) by translating between application and network formats. The presentation layer transforms data into the form that the application accepts. Converting an EBCDIC-coded text file to an ASCII-coded file, or serialization of objects and other data structures from and to XML. The application layer is the OSI layer closest to the end user, which means that both the OSI application layer and the user interact directly with the software application. Application-layer functions typically include identifying communication partners, determining resource availability, and synchronizing communication. Synchronizes communication between applications requires cooperation that is managed by the application layer. Connects one of 2^n input data lines to one output line. Are logic circuits whose outputs dpend upon state. a circuit that has two stable states and can be used to store state information. Outputs yield uniform rectangular waveforms when plotted against time. a register circuit capable of performing only PIPO data transfers. 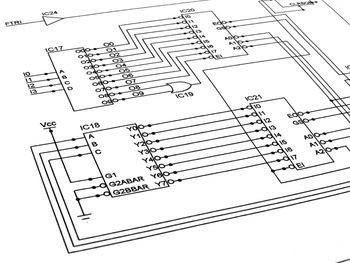 register circuit capable of performing SISO data transfers. 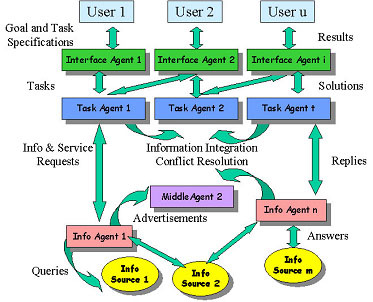 Software agents are computer programs that have specialized purpose and assigned tasks. They can perform simple and repetitive tasks faster than human workers. They can be used for personal or commercial purposes, but can also be used in malicious attacks on users. A chatbot is a a computer program designed to simulate an intelligent conversation with human users. Most chat bots simply scan for keywords within the input and pull a reply with the most matching answer from a database. Software agents (Bots) can be used to spread spam emails, viruses and scams. 1. how many times the keywords appear on the page. 4. Google assigns a page rank every search result. 7. The more links a Web page sends out, the more diluted its voting power becomes. 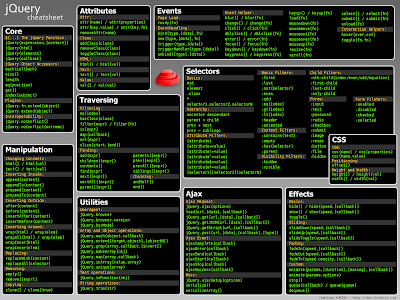 Software Agents used in personalised information management, e commerce, interface design, computer games, and complex industrial processes. They are computer programs that can be delegated to do some tasks. They are mostly self-contained programs capable of controlling its own decision making and acting, based on its environment. - Inform when temperature rises by 10% from its mean position. • Autonomy: able to perform majority of tasks without direct human intervention and have a degree of control over their own actions and their own internal state. • Proactiveness: agents takes automatic action where appropriate. Boolean algebra or Boolean logic is a calculation of truth values, developed by George Boole in the 1840s. In ICT it resembles logical multiplication xy, addition x + y, and negation −x to build combined circuits. Boolean logic or Boolean algebra is a logical calculus which has only two values, 'true' or 'false'. Boolean Logic is defined as a logical system of operators - 'AND', 'OR' and 'NOT'. It is a way of comparing individual bits and used in computer construction, switching circuits, etc. 1. Give the relationship that represents the dual of the Boolean property A + 1 = 1? 2. Give the best definition of a literal? 3. Simplify the Boolean expression (A+B+C)(D+E)' + (A+B+C)(D+E) and choose the best answer. 4.Which of the following relationships represents the dual of the Boolean property x + x'y = x + y? 6. Simplification of the Boolean expression (A + B)'(C + D + E)' + (A + B)' yields which of the following results? 7. Given that F = A'B'+ C'+ D'+ E', which of the following represent the only correct expression for F'? 9. Simplification of the Boolean expression AB + ABC + ABCD + ABCDE + ABCDEF yields which of the following results? 1. A * 0 = 0. The dual of any Boolean property may be obtained by interchanging all occurrences of the symbols (*,+,0,1) with the symbols (+,*,1,0). Beware of implicit AND operations (like xy); these ANDs are also converted to +. Therefore, the dual of x + 1 = 1 is: x*0 = 0. They say that , there are 10 people in the world. A basic introduction to jQuery and the concepts that you need to know to use it. This tutorial will take you step by step through creating your very own truncation plug-in. We are going to learn how to create our custom jQuery plug-in to show tips on mouse over event on our desired elements. We will also be able to customize the appearance of the tip division for each kind of elements in the CSS code and much more. The tutorial covers building a lightweight, flexible solution from scratch. It won't be nearly as advanced and powerful as the official plug-in. Nevertheless it will help you learn something from jQuery. Create a Vertical Scrolling Menu with CSS and jQuery: With out any hassle of dragging or clicking the scrollbar, users can navigate by just moving the mouse over the content to let it scroll automatically. Create a Horizontal Scrolling Menu with CSS and jQuery: With out any hassle of dragging or clicking the scrollbar, users can navigate by just moving the mouse over the content to let it scroll automatically. Create simple structure made of a div containing our buttons, we will use some image as buttons, and the section we want to hide/unhide. Write less code and create tabs easily with this jQuery plugin. Nowadays, websites are more and more rich and interactive and users are becoming more and more critical with all things in websites. Using windows popup to show important information are in the air and we are going to learn how to create a stunning and great window popup from the scratch using jQuery in a simple and clean tutorial. Learn how to create a smooth tabbed menu with our lovely jQuery library. With simple and clean layout we can have a great tabbed menu for this websites. Learn how to improve a little more our sites by adding some additional interactions to our search boxes like autofocus, highlighting, and auto replace default text and more by using jQuery. See how easy it is to do just that -- submit a contact form that sends an email, without page refresh using jQuery! (The actual email is sent with a pup script that processes in the background) . 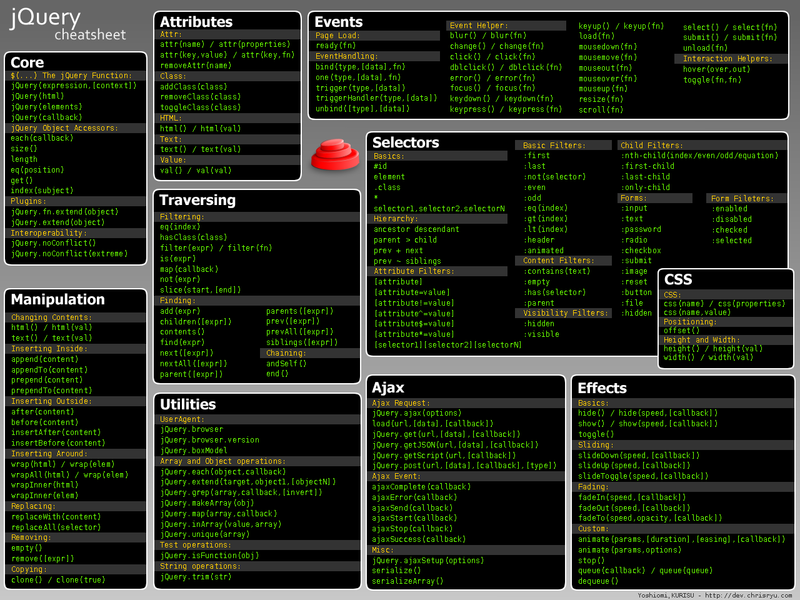 Tabbed Interface or Tabbed Structure Menu is getting really famous in web design & development. This tutorial will show you how to build your own tabbed Interface using jQuery with slideDown/slideUp effect. This tutorial teaches you how to present data using AJAX (using jQuery) with some neat effects. We can use PHP/me to store the data and call it. A modal box is a great interface solution when you want to focus the user’s attention to a specific task. It’s ideal for displaying things like alert messages, confirmation dialogues and photos.In this tutorial we’ll build one from scratch using jQuery. If you’ve been programming in PHP, or other object oriented languages, you may have come across “this” or “self”. With jQuery, we can write $(this) to select an element in the DOM (Document Object Model) . The best way to demonstrate this is with a simple example. Nice way to load images using jQuery . Learn to put in a rollover effect for the navigation on your web page. Make the image large while hovering without displacing the text. This simple tutorial will show you how to dynamically load your web content via Ajax instead of default behavior HTTP request (full round trip) . This tutorial shows how to make an Ajax based using jQuery in PHP. Create really cool light box with this jQuery tutorial. How to create a simple image slide show with a semi-transparent caption with jQuery. This example is suitable to display news headlines, or an image slide show in your website FrontPage. A really cool News Slider that uses two strollers to create very slick effect. It uses scroll To to scroll both description and image items and it comes with previous, next, play, stop and mouse over events. We will be learning how to create an attractive menu with more advanced CSS and simple jQuery script. It uses jQuery built-in fade-in and fadeout effect. Create a content sliding website that slide vertically, horizontally or diagonally. This is one of the famous techniques used by most of the portfolio websites. A little bit of style guide to create a unique lava menu for your own website. It supports styling, different animation transitions and it's so simple. Learn how to make a stunning four corners sliding effect easily with jQuery. It's elegant, unique and really cool solution for thumbnail gallery. This tutorial includes detailed explanation that will guide you through the whole process. Learn how to build thumbnail gallery with zooming effect and fade-in and fadeout caption. This tutorial will walk you through the concept behind it and how to code it. Here is compiled a list of 3 menu plugins, and and 5 ‘custom’ solutions that people have setup. Build a page which will make use of the Thickbox plug-in, but you don't want need hard code the images. Instead, you'll let ColdFusion scan a folder and create the list for you. Learn how to create a div with a field of text in it, and upon clicking a link, will load a JQuery animation, replace the text inside the box, and then load another jQuery animation. An example on how to use jQuery and Ajax.NET Professional together. Learn how to store and retrieve points with using AJAX and a server-side language. This tutorial will use PHP/me on the server, but it is basic enough that re-writing in another language should not be difficult. Quick tutorial of finding the position of the mouse on a page. Adding a live preview to the comment entry area of WordPress. Learn how to create the drag & drop interaction, the double click on icons and a basic taskbar with a start disabled button and a real clock of the system. Learn how to create a stunning and great window popup from the scratch using jQuery in a simple and clean tutorial. Learn how to create an amazing music player coded in xHTML & jQuery that made use of mouse gestures and hotkeys. You can Click & Drag with mouse to interact with interface’s music player or use directional keys & spacebar instead of mouse. Learn how to create an animated menu (very similar to Dragon Interactive menu) . Hovering links and text with CSS is very easy but you cant hover everything with it. This tutorial makes you able to hover everything! Learn how to create a counter on your input text. rease or decrease the text size (font size) on your website using jQuery. This tutorial shows how to a build complete, jQuery-based, solution for stopping spammers from miss-using your forms. Useful tutorial for those who need to know how to load dynamically some static content in their websites via AJAX. Learn how to create an AJAX website without lose the reference to the URL. jQuery makes remote scripting a piece of cake and that led me to spend more time coding additional functionalities for the auto-complete field.Learn how to use my auto-complete field. Learn how to make a stunning four corners sliding effect easily with jQuery. It's elegant, unique and really cool solution for thumbnail gallery. The jQuery UI Date picker is a highly configurable plug-in that adds date picker functionality to your pages. You can customize the date format and language, restrict the selectable date ranges and add in buttons and other navigation options easily. Learn how to generate bar, line, area, and pie charts from an HTML table, and allows you to configure them in a variety of ways. Resizable Dialog box UI for value added coolness. The post has the list of the top 5 jQuery modal Plugging which can be used to either notify or request information to/from the user. Flexgrid is a jQuery plug-in!Flexgrig uses jQuery to asynchronously populate content of the grid using either XML or JSON input. This tutorial as the example of using Flexgrid Using C# 3.0 and Line. As jQuery is such a simple language to learn, most people code their own for their own sites. Here is a compiled list of 3 menu plugging, and 5 ‘custom’ solutions that people have setup. Include your twitter stream into your blog or website, and then format it using jQuery so your tweets have an alternating background colour. This tutorial shows how to make a basic slide in/drop down menu using jQuery. The menu itself stylishly slides in and has transparencies so you can view data behind it. A tag-cloud is a great way of showing visitors to your blog the main topics of interest that are available. There is also additional information contained in a tag-cloud. Aside from the actual links themselves, which give people an idea of the subjects that your site covers, they can also show how popular the different subjects are.Learn how to create Tag-Cloud. Learn hot to create a photo site using PHP, jQuery, and AJAX. Add outbound link tracking to a new or existing site. Provided that your links to other sites have the REL attribute set, you can track them very easily with some help from jQuery. When it comes to simpler user experience, having your form validation happen instantly on the same page is a lot cleaner than reloading pages and possibly losing some form content. In this tutorial I'll show you how to use jQuery to do some instant checking on an example comment form. Learn to use the power of jQuery to create a grid layout with size-degrading headers. Magic of jQuery that makes you able to upload multiple files at once. Of course with less code. Learn how to select multiple objects from a listbox. Tranfering data between computers in different locations was started as a military computer science experiment. Today as our technology evolved, data communication become information backbone of our society. The little boxes we call modems, routers and switches were all born from a need to connect teletype machines together, transferring information started at slow 25 bits per second. At that rate, downloading 1MB might take about 4 days. But we download even full HD movies in real time on ffew hours in on .